The cholera crisis and the devastating effects of a hurricane that hit the country in 2016 have caused a major humanitarian crisis in a country where human rights defenders and journalists are subject to intimidation, harassment and arbitrary detention. 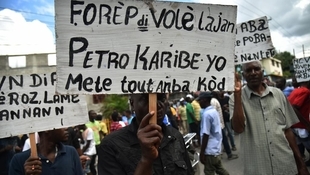 Since 7th February 2019, thousands of people have taken to the streets in the capital Port-au-Prince and other cities demanding the resignation of Haiti's President Jovenel Moise. The freedom of association is constitutionally protected, but not fully respected in practice. Human rights defenders, women’s rights defenders and lawyers pursuing corruption claims are subject to harassment, death threats, and illegal arrests. The freedom of association is constitutionally protected, but not fully respected in practice. Human rights defenders, women’s rights defenders and lawyers pursuing corruption claims are subject to harassment, death threats, and illegal arrests. LGBTI activists are also subject to discrimination and attacks. In 2016 an LGBTI Film Festival was cancel due to public threats against the organisers. Local civil society organisations in Haiti is heavily supported by INGOs, and no legal restrictions are imposed on foreign funding. According to the International Trade Union Confederation, trade union rights are systematically violated in Haiti. The freedom to assemble peacefully is protected by the Constitution. Protests and demonstrations take place fairly often, and are sometimes met with police repression. The freedom to assemble peacefully is protected by the Constitution. Protests and demonstrations take place fairly often, and are sometimes met with police repression. In a common strategy, mobs are used to disturb or dissolve protests to justify police intervention. In 2015 many people gathered on the streets to complain about alleged electoral fraud and, as protests turned violent, police used tear gas to disperse protestors. In another incident, in 2016, thousands took the street due to the cancelation of the presidential elections and security forces used tear gas and stun grenades to disperse protestors. The freedom of expression is constitutionally enshrined but not respected in practice as journalists are the targets of intimidation, smear campaigns, harassment and violence from both state and private actors, which increased during the 2015 electoral crisis.